After a beautiful and profound Christmas celebrations yesterday where Swami graciously delivered His Divine discourse, everything today seemed so pleasant and wonderful. The mood in Prashanthi Nilayam was one of joy, serenity and excitement. All the devotees, especially those from overseas, seemed to have a spring in their steps. As a befitting finale to the celebratory mood of Christmas in this holy and hallowed hamlet, Swami had permitted the children's choir to sing their heart out today evening. It was about 4:30 PM when Swami arrived for His darshan rounds. Participating children from various countries sat neatly in rows in the marbled blocks. 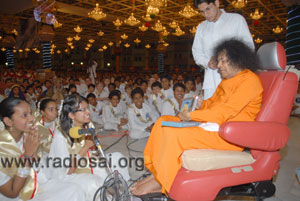 Swami took a complete round in the 'filled-to-capacity' Sai Kulwant hall. Swami moved around, granting Abhayahastas, collecting letters and spreading gentle waves of love to calm the excitement of every longing heart. By the time He went into the interview room and finally moved towards the stage for the program to begin, it was about 5:10 p.m.
A few children came up on the stage and offered roses and cards. 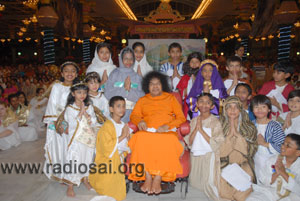 Swami saw through each card and asked the names of the children too. Then the conductor offered the "notes" to Swami and taking padanamaskar, moved down the stage to begin the programme. 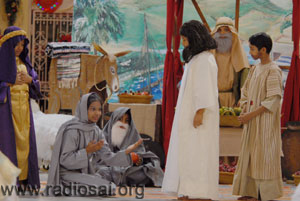 The children's choir was dramatic in the sense that there was the story of Jesus depicted behind as the choir sang. And reciprocally, the drama was very musical in content! 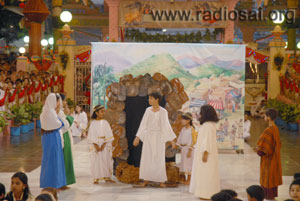 The synergy was beautiful as the scenes of Jesus making Peter multiply the loaves of bread, awakening Lazarus from his deathly slumber and resurrecting on that Easter Sunday were depicted by the children..
Swami moved down the stage and into the area where the children were seated. He began to personally distribute white cloth pieces to the boys who had participated in the drama. He called them out separately too saying, "All boys, come on” He then called the girls and gave them sarees. This was all topped by a group photograph with the actors. The flow of Grace did not stop there as Swami moved to the choir singers among the girls side and began to distribute the photo frames to them. He opened up one of the covers and taking the photo frame showed how on pressing a button, a blue light lit up the whole frame. This act lit up the girls' faces with joy. He also advised, "Put batteries and then all will function like this." Overwhelmed by His love, many broke down and Swami lovingly said, "Don’t cry. Always smile and be happy." He opened up one of the covers and taking the photo frame showed how on pressing a button, a blue light lit up the whole frame. Swami then shifted to the gents’ side and distributed the same to the choir boys. He gifted the conductor and trainer with sarees. He then called Mrs. Behner, the wife of the main organiser and gave her a saree. 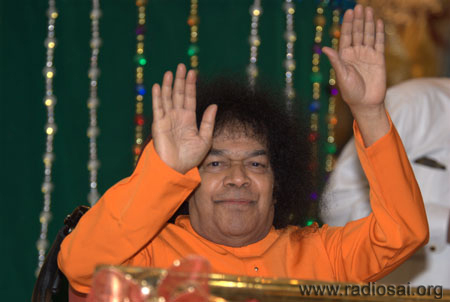 Pointing to her husband seated on the stage, Swami said, "He will feel jealous." All laughed heartily. 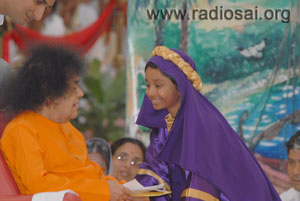 Swami moved up the stage and then as the Aarthi was going on, Swami gifted Mr. Behner with a cloth piece for a safari suit. Then He called out to his wife and said, "See, I gave him." Again there was a hearty laughter. 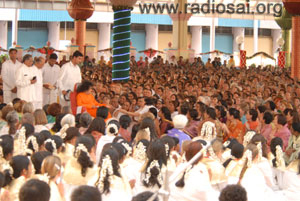 It was in this joyous atmosphere that Swami blessed all with Abhayahastha and retired at about 6:50 pm.